What do you do when you’re craving something sweet but aren’t sure how to satisfy that craving? Reach for a chocolate truffle, of course! Although you can purchase chocolate truffles in many stores or find them online, making your own from scratch is the best way to be sure you get all the flavor you’re looking for and stick to any dietary restrictions you might have, too. But how do you know which recipe to use? And if you’ve never made a truffle before, how can you know what you’re doing in the first place? Don’t worry! That’s what this article is here for. In this article, I’ll walk you through the basics of making chocolate truffles from scratch. I’ll teach you a little bit about the variations in chocolate truffles you might come across, as well as what to expect in terms of materials and ingredients. I’ll even give you some tips for making your truffles a little better every time. In the second part of the article, I’ll give you seven of my favorite recipes to help you get started, as well as my recommendation for the best chocolate truffle candy recipe. By the time you’ve finished reading here, you’ll be ready to run to the kitchen right away. So what are you waiting for? It’s time to get started! Making chocolate truffles from scratch is easier than you might think. When you understand the basics of how to make these truffles, you’ll have a better idea of how to alter the recipe to make unique changes that make truffles work for just about any flavor combination. In this section, I’ll give you a recipe for basic French chocolate truffles and then teach you a little bit more about how to work with the listed ingredients. 1. Roughly chop the baking chocolate and place it in a large heat-resistant bowl. 2. Place the heavy whipping cream in a heavy-bottomed saucepan over medium heat on the stovetop. 3. Bring the cream to just before boiling, when bubbles just start to form on the edges. 4. Add the vanilla and stir it in, then remove the cream from the heat. 5. Pour the cream over the chocolate and let stand for 1 minute. 6. Slowly whisk the chocolate, taking care to stir gently and always work in the same direction, until melted. 7. Cover the mixture and chill in the refrigerator for at least 2 hours. 8. Roll this chocolate mixture into 1-inch balls by hand and place on a lined baking sheet. 9. Place Dutch-process cocoa powder in a shallow bowl. 10. Roll chocolate balls one at a time in cocoa powder to coat well, then return to the baking sheet. 11. Chill in the refrigerator for 10 minutes to set. As you can see, a basic batch of French chocolate truffles only includes four different ingredients—and you can leave out the vanilla if you really want to! It doesn’t take much to get started making these truffles. For a French style truffle, the procedure is more or less always the same. You will need to heat cream (or a cream substitute) and pour it over your chocolate to melt it, then chill this mixture into a ganache before rolling it. These truffles aren’t dipped in chocolate but are instead coated in cocoa powder, coconut, nuts, or confectioner’s sugar. It’s a very easy way to get started on the road to more advanced truffle making! French style chocolate truffles might be the easiest ones to make, but you’re likely to encounter recipes that come from a wide variety of different backgrounds throughout your truffle making experience. If you find yourself faced with a recipe that differs from the basic one listed above, you’ll have a better understanding of it if you can recognize what style of truffle you’re working with. Dipped truffles – One of the most common variations you’ll encounter in truffle making is dipped truffles. These recipes basically include making a ganache much like the one detailed in the simple recipe above, but then dipping that ganache in melting chocolate and letting it set up into a hard outer candy shell. These truffles may also be decorated with nuts, sprinkles, or different colors of piped chocolate. Most dipped truffles are American style truffles, although some may be Swiss style. Cream cheese truffles – It’s not exactly traditional, but many truffles include cream cheese dough fillings instead of melted chocolate and cream ones. These truffles generally are easier to make and won’t require as much time to complete. They’re almost always coated in melting chocolate, and many include crushed cookies as another key ingredient. Vegan truffles – If you run into truffles that use coconut milk instead of dairy or suggest sweetening with Stevia, you might have vegan truffles on your hands! These truffles are made with ingredients that completely cut dairy out of the picture. This means that even the chocolate used for a vegan truffle will be dairy-free, making it safe for even the strictest of vegans to enjoy. Healthy truffles – Like vegan truffles, healthy truffles will include many different ingredients than those you might see in traditional chocolate truffles. You might encounter granola or chopped nuts as one of the key ingredients from which the truffle ball is held together, while cocoa takes a back seat and becomes an accent instead. Many times, these truffles are sweetened with pitted Medjool dates instead of sugar. Although it doesn’t take too much in the way of kitchen accessories to complete your truffle batch, there are a few materials you’ll almost always need for any truffle recipe. Check out this list below to be sure your kitchen is equipped for basic recipes, and then be sure to pay attention to the following list to find out if there are any extra utensils or appliances you might need to get the job done. Heat-resistant bowl – For French style truffles, you’ll need a heat-resistant bowl to pour your hot cream into your baking chocolate. Some other types of truffles will require this type of bowl as well. Choose glass or stainless steel for this item. Heavy bottom saucepan – Heating heavy cream will require a heavy bottom saucepan. This can be any saucepan that is durable and not too thin on the bottom. If it’s too thin, the milk will scald and you may ruin your pan as well. Microwave-safe bowl – Some melting chocolates for dipping only need to be heated in the microwave. For this step, you’ll need a microwave-safe bowl. Choose one made of ceramic or glass, or a very durable microwave-safe plastic bowl. Check the bottom of your bowl to see if it’s safe for microwave use. Double boiler – If you don’t have a double boiler, you can set one up with a small pot and a heat-resistant bowl. The bowl must be able to sit a couple of inches away from the bottom of the pot. Simply fill about an inch of water in the bottom of the pot and heat it to simmering, then place the bowl inside, not touching the water. This is a perfect solution for a do it yourself double boiler. Whisk – Any type of whisk will work with truffle recipes. Choose metal or silicone. Silicone whisks are easier to clean. Wooden spoon – Not every recipe will call for a wooden spoon, but it can still be a great option for stirring your ganache. Be sure to keep one on hand if you’re looking for a way to fold your ingredients gently. Forks – You will need two forks to dip any coated chocolate truffles. You will dip the truffle ball center in your melted chocolate, then pick it up with one fork. Tip it onto the other fork, and repeat this process a few times to remove excess chocolate. Baking sheet – A baking sheet that will fit into your refrigerator or freezer is crucial for any chocolate truffle recipe. You don’t need to use it for actual baking, but you will need to use it for freezing or chilling your truffles. You can replace this with a large plate or platter if you don’t have a baking sheet on hand. Parchment paper – Placing your chocolate truffles directly on your baking sheet or plate is a recipe for a broken truffle when it comes time to remove them later. Put down parchment paper to line your baking sheet first, and you won’t have to worry about removing your truffles when the time comes. Food processor (optional) – Some truffle recipes, especially those made with cream cheese or other non-traditional ingredients, will require a food processor with a pulse setting. You can also use a blender that has a pulse setting in these instances. Not every recipe will require this. Melon baller (optional) – If you don’t want to roll out your ganache centers by hand, you can use a melon baller to get the job done instead. When it comes to making truffles, there are a few tips and tricks you can follow to make a better batch every time. Although most of these tips won’t make or break your truffles, they can lead to a big difference in overall quality and appearance. This is especially important if you plan to give your truffles away as gifts or enter them into candy making competitions! Keep water away from your truffle chocolate. This will cause your melting chocolate to seize, which means either your ganache won’t set right or your coating chocolate won’t coat correctly. If you do get water in your chocolate, you can still use it, but your truffles won’t look nice in the end. Always stir your melting chocolate in the same direction. This way, when it comes time to dip your truffles, the chocolate coating will look uniform and even. This makes your truffles look much nicer overall, especially if you’re giving them as gifts. Always tap your dipped truffles on the edge of your bowl of melted chocolate to remove the excess before you put them on a lined baking sheet. Coating your truffles thinly makes for a much more uniform coating overall than doing so thickly. This means no one will end up with a bite of nothing but coating chocolate. If you’re using any add-ins in your truffles (like chopped nuts or coconut), be sure they’re fine enough to allow the ganache to set up properly. If you use nuts that are too large, for example, the centers of your truffles will be difficult to roll and won’t hold together. If you love the rich flavor of dark chocolate, you are sure to enjoy the incredible taste of it along with sea salt. If you’ve never had a sea salt sweet before, you’re really in for a treat when you take the first bite of these delicious truffles! Sea salt adds another dimension of flavor to your truffles and gives you the perfect topping, too. Serve this up at your next big party and watch them disappear fast! 1. Set up a double boiler on the stove on low heat. 2. Roughly chop both baking chocolates and add to the double boiler. 3. Add condensed milk to the double boiler as well. 4. Heat over low until melted, stirring gently but constantly in the same direction as the chocolate melts. 5. When completely melted, add vanilla and stir again. 6. Remove mixture from heat. 7. Cover mixture and chill in the refrigerator for 2 hours. 8. Roll mixture into 1-inch balls by hand and place on a lined baking sheet. 9. Sprinkle chocolate balls with sea salt and return to the refrigerator to set up for about 10 minutes more. Yes, you read that right—avocado is one of the key ingredients in these incredible truffles! If you or someone in your family has special dietary needs and can’t eat dairy (or chooses not to), this recipe gives you a great alternative without sacrificing the flavor or texture of a traditional chocolate truffle. Substitute vegan chocolate to make this a completely vegan recipe. 1. Set up a double boiler over low heat on the stovetop. 2. Roughly chop baking chocolates and add to the double boiler. 3. Add vanilla extract and a pinch of salt. 4. Stir gently in the same direction while chocolate melts, until smooth and fully melted. 5. Mash avocado well until it is completely smooth and not lumpy at all. 6. Add avocado to the melted chocolate and stir until thick and completely melted again. 7. Chill, uncovered, in the refrigerator for 20 minutes. 9. Place Dutch-process cocoa powder into a shallow bowl and roll balls one at a time in the cocoa powder to coat well. 10. Return to the lined baking sheet to chill in the refrigerator for 10 minutes more. Who doesn’t love Nutella? This popular ingredient combines the sweetness of chocolate with the rich nutty taste of hazelnut to create the perfect spread. But did you know you can also use it in your truffles? With this recipe, you’ll be incorporating Nutella into your chocolate truffles in no time. Get ready to enjoy a sweet treat that’s sure to satisfy your cravings! 1. Fill a piping bag with half of the Nutella. 2. Squeeze ½-teaspoon sized Nutella balls onto a lined baking sheet. 3. Chill the baking sheet in the freezer for 1 hour, uncovered. 4. Meanwhile, place heavy whipping cream in a heavy saucepan and heat over low until just before simmering. 5. Roughly chop the milk chocolate and place in a heat-resistant bowl along with remaining Nutella. 6. Pour hot cream over chocolate and let stand for 30 seconds. 7. Whisk slowly in the same direction until melted and smooth. 8. Let chill, uncovered, in the refrigerator for 15 minutes. 9. Whip chocolate mixture with a hand mixer until fluffy. 10. Return mixture to the refrigerator for 30 minutes more. 11. Wrap each Nutella center in fluffy ganache and place on the lined baking sheet. 12. Chill in the freezer for 15 minutes. 13. Set up a double boiler over low heat on the stove. 14. Roughly chop semi-sweet chocolate and place in the double boiler. 15. Melt slowly, stirring in the same direction, until smooth. 16. Using two forks, dip each truffle center in the melted chocolate and return once again to the baking sheet. Be sure to tap the truffles to remove excess chocolate. 17. Top with chopped hazelnuts if using. 18. Chill in the refrigerator for 15 minutes to set up. 19. Serve at room temperature. Coconut truffles are one of the easiest varieties to make, even if you’ve never made a batch of truffles before in your life. With this recipe, you’ll be able to put together the perfect French style coconut truffles that look beautiful and taste great, too! This recipe doesn’t require a lot of extra knowledge when it comes to candy preparation, so you’ll only need to be able to combine your ingredients properly to put together these tasty treats. 1. Add biscuits to a food processor and pulse on high until ground into a fine flour. 2. Place biscuit flour in a large bowl and add ½ cup of the coconut along with all of the cocoa powder. 3. Combine until mixed thoroughly. 4. Stir in condensed milk slowly, a little bit at a time, and mix well until a dough is formed. You might not need the entire can of milk. 5. Roll chocolate mixture into 1-inch balls by hand. 6. Place remaining coconut in a shallow bowl. 7. 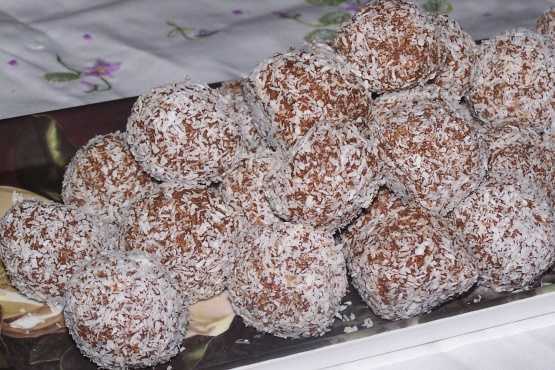 Roll chocolate truffle balls in remaining coconut to coat thoroughly. 8. Chill, uncovered, in the refrigerator for at least 30 minutes. This is a unique truffle recipe that’s sure to please the little ones in the family! With ingredients that stray a little bit from the traditional, this recipe can help you create truffles that taste exactly like a creamy, smooth cup of hot chocolate. Decorate them with your favorite colored candy sprinkles and you’ll soon have truffles that everyone in the family will want to try. 1. Add vanilla wafer cookies to a food processor along with the hot cocoa mix powder and pulse on high until blended into a fine flour. 2. Add whipped topping and pudding and pulse until a ball of dough forms. 3. Add marshmallows and pulse until marshmallows have been chopped finely. 4. Roll mixture into 1-inch balls and place on a lined baking sheet. 5. Chill, uncovered, in the freezer for 30 minutes. 6. Add chocolate chips and vegetable oil to a large microwave-safe bowl. 7. Microwave on high for 30 seconds, then stir. 8. Repeat this process until the chocolate has become melted and smooth. 9. Dip each chocolate truffle ball into the chocolate using two forks. Tap to remove the excess. 10. Return to the lined baking sheet and chill in the refrigerator for an hour and a half. Although the taste of pistachio might not be for everyone, if you’re a fan of this chewy, delicious member of the nut family, these truffles are sure to please! The ganache center of these truffles is made with chopped pistachios to give it a little bit of a crunch along with a flavor you’re sure to enjoy. These truffles make excellent presents for Valentine’s Day, the holiday season and much more! 1. Add heavy whipping cream to a large saucepan with a heavy bottom. 2. Cut up butter and add to the saucepan with the whipping cream. 3. Heat over medium, stirring constantly until cream is bubbling and butter melts. Do not boil. 4. Remove mixture from heat and add dark chocolate chips. Do not stir. 5. Let stand 5 minutes, then whisk vigorously until smooth and creamy. 6. Place pistachios in a food processor and pulse on high until chopped finely. 7. Stir pistachios into chocolate mixture. 8. Cover mixture and chill in the refrigerator for 2 hours. 9. Roll mixture into 1-inch balls by hand or using a melon baller. 10. Freeze for 10 minutes on a lined baking sheet to harden. 11. Place milk chocolate chips in a large microwave-safe bowl along with vegetable oil. 12. Microwave on high for 1 minute, then stir. Microwave for 20 seconds more, then stir again. 13. Repeat this process until chocolate has melted and is completely smooth. 14. Dip truffles one at a time using two forks and tap to remove the excess chocolate from each one. 15. Return to the lined baking sheet and top with sea salt if using. 16. Chill in the freezer, uncovered, for 10 minutes more. Round out your list of delicious chocolate truffle recipes with this unique twist on the classic. These Mayan Truffles include a lot of unique ingredients to give your candy a smooth creaminess with a kick at the end. If you’re a fan of spiced chocolates, then look no further than this great recipe to help you get started on the road to making truffles that you’ll never forget. 1. Finely chop baking chocolate and add to a large heat-resistant bowl. 2. Add orange zest, chipotle chili powder, cinnamon, sea salt, and the contents of the vanilla bean. Toss to combine ingredients well. 3. Place coconut milk in a small heavy-bottomed saucepan on the stove over medium heat. 4. Add coconut oil and stir to combine. 5. Heat coconut milk and coconut oil together until just simmering. 6. Pour coconut milk mixture over chopped chocolate and spices in the bowl and let stand for 30 seconds. 7. Stir constantly in the same direction with a wooden spoon until completely melted, smooth, and thoroughly combined. 8. Place the mixture into a small glass baking dish lined with parchment paper and roll into a log shape as well as you can. 9. Chill, covered, in the refrigerator for at least 8 hours. 10. Remove from the refrigerator and slice into chunks. If desired, roll these chunks into ball shapes and chill for 10 minutes to set up again. If you prefer, you can leave these in squares for a more rustic truffle. 11. Toss chunks with Dutch-process cocoa powder to coat thoroughly. With so many different chocolate truffle candy recipes to pick from, it’s easy to see why you might need a little guidance to help you get started! The world of truffle recipes is diverse and delicious, and no matter what kind of taste you’re looking to create or what sort of ingredients you prefer to work with, you can easily find a truffle recipe that suits your needs and gives you a chance to try your hand at whatever experience level you’re most comfortable with. But what if you still aren’t sure where to get started? How do you know which recipes are really the best of the best? Don’t worry—I’ve got recommendations to help you out! If you’re looking for the best truffle candy recipe overall, I recommend starting with the Sea Salt Truffles. This is a great, traditional truffle recipe that gives you a chance to see what it’s like to work through a standard version of truffles with only a few twists. It doesn’t stray too far from the basics, and when you’ve finished with it, you’ll have a very flavorful batch of truffles that work just as well for a day-to-day snack as they do for a gift. For something a little more unique and original, however, you might prefer to go with the Mayan Truffles instead. These are the perfect gift truffles since they taste impressive and look great, too. Wow your friends and family by putting together a truffle recipe that strays a little bit from the standard by incorporating plenty of unique ingredients to give these truffles an amazing flavor throughout. Best of all, even though this recipe utilizes different ingredients, they’re still not too hard to find in most any grocery store. Whichever recipe you choose, grab your ingredients, head to the kitchen, and give it a try right away. You’re sure to be pleased with the results!